The town of Dipkarpaz (Greek Rizokarpaso) has little to delay the visitor today, except perhaps the petrol station. A few 18th-century houses remain, and the restored Arch Houses, now a hotel, are worth a quick nose around, but on the whole the modern buildings are unmemorable. Set up on the hill to the left is the plain whitewashed church of Ayios Synesius, still used by the Greek community. 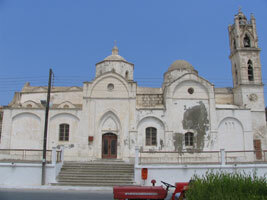 The church stands on the site of the Orthodox cathedral which was built here in the 13th century when the Greek Orthodox bishop was banished from Famagusta to Rizokarpaso by the Catholic Crusaders. The town has always been predominantly Greek, and you will notice a prevalence of blue or green eyes in the locals. Travellers of earlier centuries imagined the place filled with exotic beauties, but most modern visitors will search in vain.